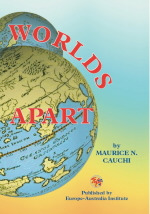 Worlds Apart, Migration in Modern English Literature, by Maurice N.Cauchi. This book deals with the many issues faced by migrants all over the world as described in the English literature of the last half-century. Prof. Maurice N. Cauchi, Chairman of the Maltese Community Council of Victoria, and President, Ethnic Communities' Council of Victoria. The book was launched on the 18 March, 2003 at the Maltese Community Centre, Parkville, (Melbourne). This function was hosted by the Maltese Historical Society, The University of Victoria and the Maltese Community Council of Victoria.